The days following a holiday can present the best opportunity to get organized, take inventory, and set yourself up for success to start the new year. 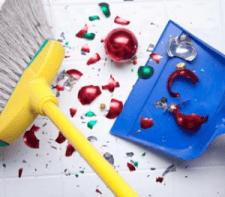 Here are 5 things to do after Christmas that will pay in unmeasurable dividends when it comes to your budget, state of household, and peace of mind. Find yourself with a kitchen full of leftovers? Don’t let them go to waste! Recycle the remnants of your holiday feast to make something new. Take advantage of huge discounts on holiday decorations at local retail stores. The days following Christmas are often the best time to purchase gifts for next year too! If you received cash or gift cards this Christmas, take into consideration your current and upcoming expenses. Put a plan into action on how to best use them to better your financial situation. If you used a real tree this year, trim off the branches and scatter the boughs around your garden. The pine needles will eventually fall off and will help your soil retain moisture. In order to make room for the gifts you received this holiday season, consider donating older items you no longer use to the less fortunate. This simple task will not only benefit those in need, but also keep you from growing out of your storage space. Read how Logan A/C & Heat Services donated a furnace to a local family in need this Christmas! If you have heating needs for the New Year, consider exploring your HVAC options now before the cold sets in for good! Call Logan Services of Dayton, Columbus and Cincinnati, OH today at (800) 564-2611!